The options were yes or no, the assumption being that civil liberty activists are more worried about armed insurgents than civilians. That assumption is a familiar one for film-maker Sanjay Kak, whose documentaries Words on Water, on the struggle against the Narmada dam, and Jashn-e-Azadi, on the Kashmiri pro-independence movement, dispense with objectivity and take an explicit and vocal stand against the Indian state. After screenings in Delhi and Punjab, the film will travel to Mumbai, Bangalore and Hyderabad in the coming weeks. Although Kak makes the case that tribal resistance goes back several decades, and that governments in states like Chhattisgarh are only new manifestations of systemic oppression, the recent killings makeRed Ant Dream a red-hot documentary. The film maps three troubled zones—apart from the Maoists in Bastar in Chhattisgarh, there are tribals battling industrialists in Niyamgiri in Orissa, and a culture of protest built around the memory of Leftist revolutionary Bhagat Singh in Punjab. Seen together with Words on Water (2002) and Jashn-e-Azadi (2007), Red Ant Dream is about India Burning, as it were. The three films are about “the idea of resistance”, Kak says, but he traces this resistance through its foot soldiers rather than its generals and ideologues. Red Ant Dream is three films rolled into one. It is in the mould of documentaries like Amar Kanwar’s A Night of Prophecy (2002), which examines protest music, theatre and literature across India, and Anand Patwardhan’s Jai Bhim Comrade (2011), whose examination of caste taps a rich vein of Dalit protest music. The Punjab segment in Red Ant Dream, which follows groups inspired by Bhagat Singh’s pre-independence Marxist critique of colonialism and inequality, intermingles with on-ground footage of rallies against mining in Niyamgiri and a clandestine encounter with Maoist groups in Bastar. The Punjab chapter too could have been its own film. Kak first went there trailing the revolutionary poet Avtar Singh Sandhu, who wrote under the pseudonym Pash. “I asked a professor what remains of Naxalism in Punjab today, and he said culture and poetry. Of course, the connection between Pash and Bhagat Singh emerged, and I could see the mobilization around this constellation.” Some viewers have embraced the seeming digressions into Punjab, while others have been “baffled and annoyed” by it, Kak says. The most talked about section, at least for the moment, is likely to be the one that gives the documentary its name. 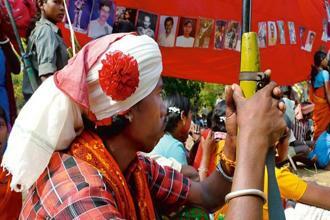 Kak travelled to Bastar with writer and activist Arundhati Roy for two weeks in February 2010. He shot Maoists speaking about their motivation to engage the government in battle and sharing a dietary secret—a paste of the eggs of red ants. The approach to editing pretty much sums up Kak’s larger perspective on the role of the documentary. He belongs to the strain of independent documentary film-making that developed in the 1970s in stark opposition to the broadly propagandist Films Division vision of an India on the up. The country spotlighted by these film-makers is an unequal and unjust place in which tribals are being kicked off their land, women abused by population control policies and slum-dwellers ignored by urban policies. The documentaries are diverse in style and ideology, but they are bound together by disagreement with the way things were. Red Ant Dream will be screened in Mumbai at the Alliance Française on 14 June, 7pm, and at the Films Division auditorium on 15 June, 4pm. Click here for details about screenings in other cities.